Every year in the United States, about 50,000 people suffer serious injuries in motorcycle accidents, 3,000 receive fatal injuries. In Riverside alone, motorcycle accidents killed or injured more than 163 in a recent year. Many of those deaths and injuries are not due to errors on the part of the driver, but rather due to other motorists or manufacturing errors. If you’ve been involved in a motorcycle accident, you don’t have to worry about facing the difficult legal process on your own. At Aitken * Aitken* Cohn, we have extensive experience and a track record of success in a wide range of personal injury cases, including motorcycle accidents. If you’ve been involved in a motorcycle accident and need help getting the compensation you deserve for your injuries, contact us today at (951) 534-4006 to learn more about the legal options available to you after your accident. When you choose an attorney after your motorcycle accident, you want to be sure that you’re getting someone you can trust: a law firm with a strong success record and plenty of experience to bring to the table. At Aitken * Aitken * Cohn, we have successfully supported many clients through personal injury cases in a variety of platforms, including motorcycle accidents, truck accidents, and more. Consider some of our past case results. Our past experiences speaks volumes to the quality of our representation. While there are no guarantees of what we will be able to accomplish in your case, as each client is unique, we can nonetheless bring our considerable experience and knowledge to the table to help increase the odds that you will get the award you deserve for your accident and your injuries. If you’re struggling in the aftermath of a motorcycle accident and feel that you deserve more compensation than you’ve been offered, let us work with you to establish the proper course of action. Road rash. Road rash is particularly common in motorcycle accident cases where the motorcycle driver or passenger wasn’t wearing appropriate protective gear. Road rash occurs when the driver or passenger skids across the pavement, often leaving behind painful scrapes and lacerations. In some cases, road rash can result in extensive scarring or long-term damage to the nerves underneath the skin. Nerve damage may heighten sensitivity or erase it. Amputations. Because motorcycles provide so little protection to their riders, amputations can quickly result when the rider makes contact with outside objects at a high level of force. Extreme crushing damage to the rider’s limbs can also necessitate amputation later. Organ damage. Organ damage can occur when high force strikes a motorcycle rider or they strike an object or the road at a high rate of speed. Organ damage may not be immediately evident at the scene of the accident or may appear as tenderness or pain in the abdomen. Spinal cord injuries. While whiplash is fairly common in many types of car accidents, spinal cord injuries may be even more serious in the case of motorcycle accidents. Motorcycle accidents with spinal cord damage may result in long-term pain and suffering, decreased mobility, and even paralysis. Traumatic brain injury. Wearing a helmet can significantly decrease the risk of head trauma in a motorcycle accident. Unfortunately, no helmet can erase the possibility of traumatic brain injury entirely. Symptoms of traumatic brain injury may be mild, including mild memory problems, or become very significant, including a long-term struggle with short-term memory, personality changes, changes in sensory processing, and difficulty completing daily tasks. Traumatic brain injury may have short-term symptoms or result in long-term struggles. Broken bones or soft tissue damage. Broken bones, sprains, and strains can all significantly complicate life for a motorcycle rider, especially one who works in a highly physical job or who engages in sports and other activities on a regular basis. Mental trauma. In many cases, mental trauma can be even more difficult to overcome than the physical injuries associated with a motorcycle accident. PTSD is common among accident victims, especially those who strongly believed that they were going to die as a result of the accident. Mental trauma may express itself as increased anxiety, or it may show up as flashbacks or difficulty getting back on a motorcycle. Sometimes, mental trauma is fairly localized and expresses itself only around things associated with the accident. In other cases, however, it may be widespread and impact many different areas of the victim’s life. Death. In some cases, injuries sustained in a motorcycle accident may be severe enough to lead to death. Who Is Responsible for Your Injuries Sustained During a Motorcycle Accident? Motorcycle accidents aren’t just highly traumatic. They can also be very expensive. By defining who is liable for the injuries and damages sustained during your motorcycle accident, you can better define who is responsible for paying for those expensive bills as they pile up. Unfortunately, motorcycle accident cases can also be highly complicated. There are many factors that could influence who is responsible for the circumstances of your injuries and, therefore, who is responsible for helping to pay those bills. The other driver. Most commonly, the driver of the other vehicle is responsible for the accident. The other driver may, for example, have failed to follow road etiquette or to exercise appropriate safety precautions. In some cases, the other driver may have been distracted: texting and driving or talking on the phone, for example. A bar or restaurant that over-served a driver. If the driver who struck your motorcycle was intoxicated at the time of the accident, understanding where they got the alcohol they were drinking can help define who is responsible for your injuries. Bars and restaurants bear a duty of care to their patrons and others in the area that requires them to monitor what their patrons are consuming and not over-serve someone who is known to be driving. If the driver responsible for your accident was over-served, that bar or restaurant may bear partial liability. Defective motorcycle parts. Did a mechanical error cause your motorcycle accident, especially a single-vehicle accident? You rely on your motorcycle to perform as expected for you every time you get on it. Unfortunately, defective parts—especially wheels and tires or parts that impact steering—can cause serious hazards for motorcycle riders. If a defective part led to your accident and therefore to your injuries, the manufacturer and others in the chain may bear responsibility. Inadequate repairs. Has your motorcycle recently been repaired? Whether you had it in the shop for a warranty repair or you recently had work done to keep your motorcycle running its best, the repair shop that took care of those repairs is responsible for providing you with a high quality of service, including a bike that will run well and has no potential mechanical problems associated with that repair. If an inadequate repair led to an accident, the repair shop and the mechanic that worked on your bike may be held responsible. The mechanic may also be held responsible if they should reasonably have been expected to notice a potential problem with your motorcycle during the course of the repairs, but failed to do so. Hazardous road conditions. Potholes, uneven pavement, and increased debris in an area can all present potential hazards on the road—and those hazards are worse for motorcycle riders than they are for drivers in larger vehicles. The city may be held liable for keeping roads as safe as possible. Road construction crews. Normally, streets are carefully designed to ensure that they are safe for all drivers on them, including cars, big trucks, and motorcycles. During road construction, however, crews may not pay as much attention to potential safety hazards as they would under normal circumstances. If road construction created dangerous traffic patterns that led to your accident, that construction crew may be held partially liable for your injuries. Visual obstructions. Motorcycles are more difficult than cars to see at the best of times, and many drivers struggle to remember to look for the much smaller vehicles when they’re focused on cars on the road. Visual obstructions, however, can make motorcycles even more difficult to see, leading to a higher incidence of accidents and injuries. In this case, the person who put that obstruction in place may be held liable for your accident and your injuries. Company owners. Did the vehicle that struck you belong to a company, including a trucking company? Was the driver on the clock or taking care of work-related responsibilities at the time of the accident? If so, that company may bear partial liability in your accident case. This is particularly true if the company required drivers to drive in unsafe conditions, especially those in which they were uncomfortable driving, or if the driver has been involved in several accidents or been ticketed several times in the past. Companies have a duty of responsibility to hire employees who are responsible and who will take care on the roads, and allowing drivers who could infringe on the safety of others on the road to continue driving violates that responsibility. After a Motorcycle Accident, What Damages Can You File For? 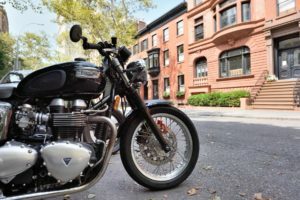 The damages you can recover after a motorcycle accident will depend on a variety of factors: the full coverage amount of the insurance policy carried by the other driver; who was responsible for the accident; and how severely you were injured. If you bear partial responsibility for the accident, for example, your settlement may be reduced by the percentage of the responsibility that you bear. If you were more than 50 percent responsible for the accident, you may not receive any damages at all. There are, however, several common damages that you can ask for after a motorcycle accident. Coverage of your property damage. Motorcycles are often designed to be lightweight. Their small size and lightweight construction often mean that it’s easy to seriously damage them during an accident. Your property damage, however, should be covered quickly by the other party’s insurance company. Property damage may also extend to personal possessions of value that were destroyed during the crash, including riding suits, your cell phone, or any equipment in your saddlebags at the time of the accident. Payment for your medical expenses. After a motorcycle accident, medical expenses can be very worrying. You may have to pay for extensive medical bills, including the cost of ongoing rehabilitation after a serious injury. Compensation for your medical expenses may also include compensation for the amount needed to modify your home or vehicle to allow you to continue enjoying a high quality of life following a life-altering injury like paralysis or amputation. Compensation for lost wages. After your accident, you may find yourself unable to work, either short-term or for a long period of time. With medical bills mounting, the loss of your wages may be devastating. As part of the compensation you may receive after your motorcycle accident, you may be able to include compensation for those lost wages, which will allow you to continue to take care of your regular expenses after the accident. Reparation for lost income potential. Sometimes, after a serious motorcycle accident, your life may change forever, leaving you unable to complete the full responsibilities associated with the job you once held. If you’re unable to return to work in your former capacity due to your injuries, you may be able to receive compensation for that lost income potential. Funeral and burial expenses. Did you lose a loved one as a result of a motorcycle accident? If a life was lost due to an accident, you may be due compensation for funeral and burial expenses. Shift liability, insisting that someone else was responsible for the accident. Parts manufacturers, for example, may attempt to prove that you weren’t taking proper care of your motorcycle, while road crews responsible for creating hazardous conditions may try to prove that you were driving unsafely. Provide a low settlement offer. This is especially common immediately after the accident, when you haven’t had a chance to determine how much money you’re really going to need to recover. If you’ve been involved in a motorcycle accident, speaking to and hiring a lawyer may be the best course of action for you to properly get the compensation you deserve. At Aitken * Aitken * Cohn, we’ll start with a free consultation to learn more about the circumstances of your accident. In most cases, we take our clients on a contingent fee basis: our compensation comes out as a portion of your settlement or award, rather than being paid up front. Working with an attorney can help you determine exactly who is liable in your motorcycle accident case and, in many cases, significantly increase the settlement amount you may be due. In many motorcycle accident cases, it is more expensive not to hire an experienced attorney. If you were in a motorcycle accident, don’t wait to work with an experienced attorney who will help you negotiate with insurance companies, determine who bears liability for your injuries, and move forward with your life. Call us today at (951) 534-4006 or use our confidential contact form to schedule your free consultation in our Riverside or our Santa Ana office.